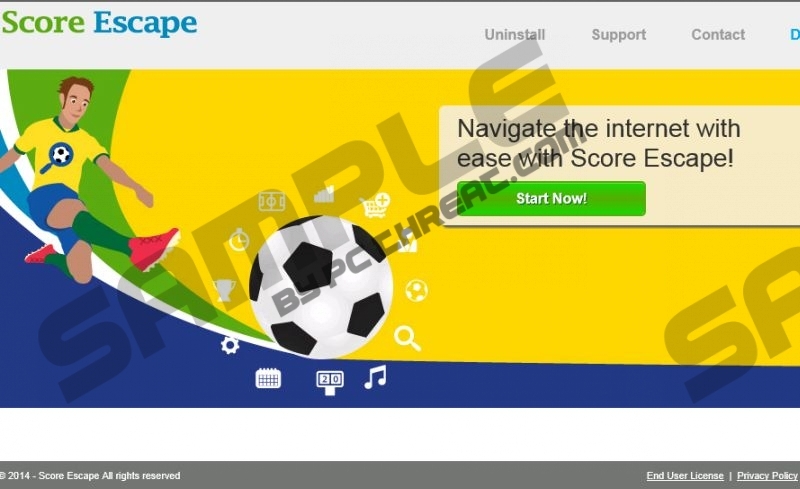 Score Escape is an adware application that tries to convince you to keep it on your computer by promising to allow you to “navigate the Internet with ease”. Sadly, it’s sure to make your Internet browsing harder by spamming you with commercial advertisements. If you don’t like your browser window taken over by various pop-ups and other ads, remove Score Escape from your system. Score Escape is made by Super Web LLC, which is also responsible for applications like Neon Great and Fact Fire. Seeing as Score Escape’s website seriously lacks any meaningful information, the most likely way you got this adware is via a freeware bundle. While bundles contain a useful program you might have looked forward to using, you probably rushed through the installation. If you don’t uncheck boxes offering to install additional software, the setup wizard will count it as your agreement to install them. To avoid getting programs you don’t want, always choose Custom installation and carefully read everything. We also recommend downloading a spyware scanner to check if your system is infected. Professional programs can also remove any threats. When Score Escape gets on your computer, it gains access to your Internet Explorer and Mozilla Firefox. It then proceeds to collect information about your browser activity to figure out your needs. Score Escape uses this data to tailor the commercials it shows to get you to click them. Once you do click them, you get redirected to a potentially unsafe third-party website and Super Web LLC gets paid. This is called a pay-per-click scheme. PPC is a favored method of monetization for all adware applications. You don’t get your share of the money, so we don’t thinks this to be fair. It’s best to remove Score Escape and all other adware from your system. While Score Escape is not hard to remove manually, we recommend getting a professional automatic spyware removal tool, like SpyHunter. It can perform a full system scan with a click of your mouse button. It will find any and all threats present on your computer and remove them when you click “Fix Threats”. Simple as that. In case you want to delete Score Escape yourself, the instructions are given below; however, we have to point out that you will only uninstall Score Escape this way. Who knows what kinds of threats could be present on your system. You could remove all but the most dangerous of them manually. The problem is that it’s not always easy to know what is useful and what is just useless. Click Uninstall a program and uninstall Score Escape. Go to Start menu, click Control Panel, and go to Uninstall a program. Select Score Escape and click Uninstall. Quick & tested solution for Score Escape removal.